I was sitting at my little table in the Grand Rapids, MN Mall selling books to strangers outside of Village Books when I spied Payback at Morning Peak on the remainder table. Every title on the table was five bucks, even newer releases. 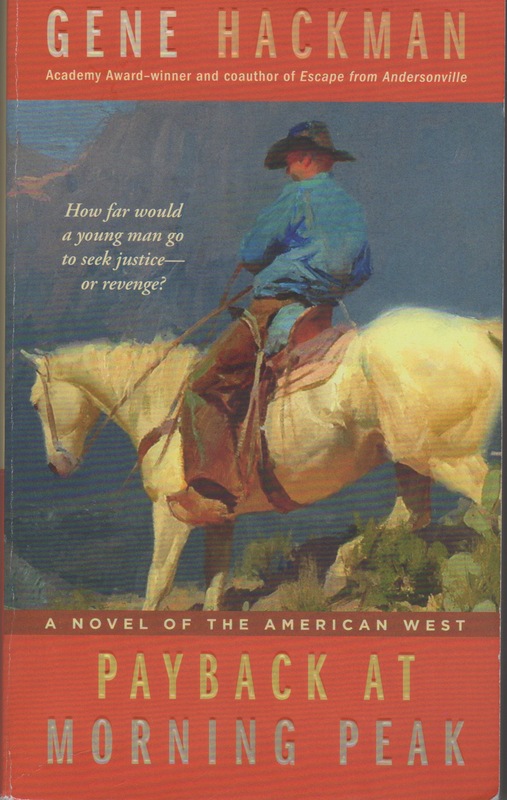 When I saw this Western had been written by one of the best known character actors of our time, well, I had to give it a read. I’d heard somewhere that Academy Award winning actor Hackman (French Connection and Unforgiven) was also an author. My supposition was that, if someone is talented enough to star in over eighty movies, well then, he or she might just be creative enough to pull off a good yarn as a writer. And so, I laid my money down and gave Payback at Morning Peak a try. There are so many things wrong with this effort, where to begin? The best that can be said about the plot of Payback is that it’s an updating of the revenge scenario that drove a very good performance by Steve McQueen in the 1966 classic Western, Nevada Smith. Hackman, himself a contemporary of McQueen’s and a star of several Westerns during his own film career, retired from acting after 2004 (bowing out after the silly and pointless Welcome to Mooseport) seems to have chosen the revenge theme of Nevada Smith but that’s about where the similarities end. Jubal Young, a seventeen-year-old doesn’t compare favorably as a hero to Max Sands, the part played by McQueen. Why? Well, the suspension of disbelief, the core task of any fiction writer in taking a fantasy and making it seem real, begins and ends with the believability of its hero or heroine. In this tale, Jubal is said to have essentially borrowed his father’s .22 lever action rifle for the first time to hunt rabbits, when, upon returning to his family’s ranch, he sees his father, mother, and sister being killed by a group of thugs. Despite little back story as to Jubal’s prowess as a sharpshooter, and despite the fact that a .22 rifle makes a poor choice of weapon for long distance sniping, Jubal proceeds to take out some of the bad guys from a distance with impunity. But it gets worse. What follows is a convoluted, difficult to follow scene where the desperadoes chase the young lad up Morning Peak only to fall (pardon the pun) for a ruse Jubal has concocted to do them in. Later, after the teenager finds his father’s pistol in the ruins of the family farmhouse, he becomes not only an instant marksman with the .22: He bests grown men who’ve made their livings using six guns as meal tickets when metal slaps leather and gunfights erupt. But there’s more that ails this story than simply plot implausibilities. The dialogue is clunky and forced; the characters are thinly drawn and cartoonish; and the interaction between Jubal and his adult peers in the story seems extremely unlikely given the history and background of Jubal’s character as supplied by the author. There’s no question that, if Gene Hackman actually sat at the computer to create this story (I’m hoping he did: pity the ghostwriter who cobbled together this mess) he has passable skills as a writer of the English language. The narrative portions of the book, while unmoving and lacking real insight or empathy or pathos, aren’t offensive and, in terms of description, admirably capture the high country of northern New Mexico and southern Colorado where the story is set. Hackman is an observer of the world and it shines through in his ability to depict scenes in his backyard. But he is, sad to say, no storyteller when it comes to writing fiction. In the end, while Welcome to Mooseport wasn’t Mr. Smith Goes to Washington, it was entertaining and a coherent, if silly and forgettable, movie. Payback at Morning Peak is unforgettable for all the wrong reasons. It’s telling that none of the blurbs on the back cover of the novel are about this effort, but about Mr. Hackman’s past writing efforts. Sadly, given my disappointment after spending time with Jubal Young, I won’t be reading any other novels by Popeye Doyle. 2 stars out of 5. Designed by Cloquet River Consulting & Design.